Tonight AMERICAN IDOL continues on FOX with a new episode. Tonight the competition continues as the Top 12 finalists perform songs that remind them of home Did you watch last week’s when the Top 13 performed? We did and we recapped it right here for you. If you missed any of the performances from last week, don’t worry we have you covered. We have all the videos for your enjoyment, right here. On last week’s episode the Top 13 opened the show performing a mash-up of the Imagine Dragons’ hit, “Radioactive” and OneRepublic’s “Counting Stars.” 71 million votes were cast in the battle to reach the Top 12 – the results were revealed throughout the night. By the end of the evening Kristen O’Connor was eliminated. On tonight’s episode the Top 12 finalists compete for America’s vote. Ben Briley, C.J. 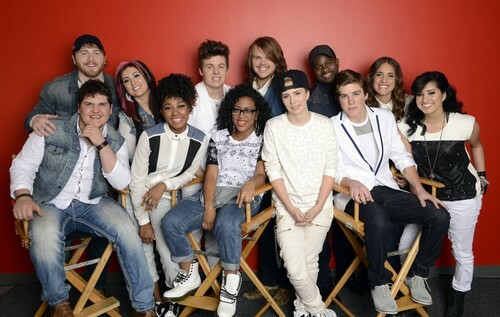 Harris, Jena Irene, Caleb Johnson, Jessica Meuse, MK Nobilette, Emily Piriz, Alex Preston, Dexter Roberts, Majesty Rose, Malaya Watson and Sam Woolf – will perform songs that speak to their “Home.” Song selections can range from a song that was popular during their childhood to a tribute to their home state. Tonight’s show is going to be an exciting one, which I’m not going to miss and neither should you. So be sure to tune in for our live coverage of FOX’s American Idol XIII – Top 12 Finalists Perform – tonight at 8PM EST! Celeb Dirty Laundry is your go to place for all the up-to-date American Idol News! Don’t forget to come back tomorrow to find out who goes home. Who do you think had the best performance tonight? Who do you think will be sent home?